I understand most beer connoisseur's are wanting those strong - hop heavy brews. Not this gal, I honestly appreciate the refined light flavor, feel and smell of this lovely Lager. The feel on your tongue feels like a tangy kiss of Beer. The look has a beautiful effervescence, and it IS a refreshing sparkler of a beer. I drank 3 straight in a row. Bottle aside - it is a wonderfully refreshing alternative to the dark/strong/hoppy syrups that are the standard fave. Best thing about it is the cool blue bottle. Friend brought me some sight unseen from St. John’s and she doesn’t know anything about beers. Nice thought that I appreciate but the beer is just passable as beer. Watery, kind of a strange smell, weak color and not much taste. Glad I tried one npbut wouldn’t recommend it. 20,000 years old Iceberg water is used. Noce sounds ! This is Lager. Not expect too much. Light yellow color with a bubbly white head. Kind of cool blue bottle. Thin watery beer with hints of malt and hops very crisp and refreshing but little beer i ness here. Hell of a gimmicky beer. A good beer, but I was a bit disapointed, since it is made from super clean frozen water. I was especting a particular taste for this one, but fially it was smooth and easy to drink, like any commercial beer, or lager. The bottle is beautiful, and the concept perfect, but the taste could be a little bit more hopy. A very regional beer. Seeing as the beer is made in an area dominated by light beer, which is the choice for drinking, it does much better than other mass produced light beers. The bottom line with a beer like this, is that you won't like it if you don't appreicate light beer for what they are. As such, it's pretty good for what it is intended to be. It's not a Rochefort, it's not a Guinness. It's a light lager. This is a terrible beer. If you poured it out of the fancy bottle into a glass, you'd assume you were drinking Coors Light or some other mass-produced swill. "QV" could just as easily stand for Quite Vanilla. And at almost $20 for a 6-pk, this has got to be the least value-for-money offering in a place where all beer is egregiously priced. Seriously, whether there's iceberg water in this or not (! ), there's nothing else in this beer to even notice, let alone appreciate. The brewery chose instead to focus on the marketing, putting it in a blue bottle....which, in fairness, has resonated EXTREMELY well with gullible tourists. But between the taste, the price, and the iceberg 'shtick', this offering is truly an affront to craft brewing. Poured from 330mL bottle into pint glass. Quickly goes to form an unimpressive head, that truly lacks any beer-like characteristics, looking more like that formed when pouring a soft drink. Body is straw in colour and fully transparent. Scent is mild, yet crisp, seeming more timid than dull. Following this, the taste follows with the same mild crisp flavour hinted at by scent, with a slight sweetness on the tip of the tongue, vaguely bland, light-beer type of taste in between, and a typical lager finish. Mouthfeel is as well pleasantly light. Overall an alright beer, though certainly one I will not jump to drink. Certainly a must-try for anyone visiting Newfoundland at the same time, as the use of iceberg water in brewing definitely makes for a unique experience. I tried this beer while visiting the Quidi Vidi brewery back in 2011. 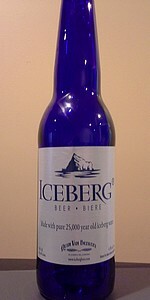 Brewing beer from icebergs is a fun idea. During my stay in Newfoundland, I collected pieces of shored icebergs for my morning coffee while the locals gathered them to cool their whiskey. With this in mind, it seems appropriate to have the local brewery craft a beer from the same source. The problem, however, is this beer tastes too much like water. Not any kind of water, tasteless water that has been stripped of all its natural minerals. This may be the result of the local beer culture. Newfoundland has a small population and the majority of the population drinks light beer. The brewery is thus forced to make these kinds of beers in order to be sustainable. In fact, the brewery there does not deny that this beer is made to appeal to the above-mentioned consumers as well as visitors who are not avid beer drinkers but who are intrigued by this beer. In summary, a fun idea but not a beer for me. Poured from a 341ml bottle with no #freshbeer info on the bottle but J 30 13 on six-pack. Unclear if that`s a bottling or best before date. Pours a totally clear, barely yellow body with tiny bubbles racing up (only nice thing about it). Aroma is mild graininess. Grasping at straws for flavor, maybe wet malt. Finishes with a staleness. Lacks body, flavor and direction but not offensive so was able to finish the bottle. Still, not the best.